The Constitution Club is hosting Tom Bennett, State Representative, at the library Dec. 12 at 7:00 pm. Tom is back by popular demand after talking to us 2 years ago. He filled us in on what was going on in Springfield. If you live in Pike Township he is your representative. Even if you live elsewhere you will learn a lot from him. 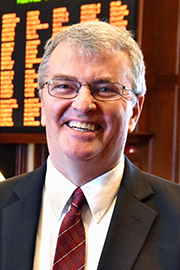 Tom has served as the Illinois State Representative for the 106th Representative District since 2015 and serves all or parts of Livingston, Iroquois, Woodford, Vermilion and Ford Counties. He is very knowledgeable and friendly. Everyone is welcome. If you wish to attend and can’t manage the stairs, call us and we will move the venue – 815-945-4253. Once a year the Library closes for the entire holiday and weekend – and that is Thanksgiving. We close at 5:00 pm Wednesday, Nov. 21 and re-open on Monday, Nov. 26. We are very thankful for all of you. Enjoy the holiday. We Are Also Grateful To All Who Voted For A New Library.